orange and purple and blue....I can sing a rainbow....bla bla bla. Pirelli has revealed the colours it will use during the 2011 F1 season to distinguish the six different types of tyre that will be available to teams. 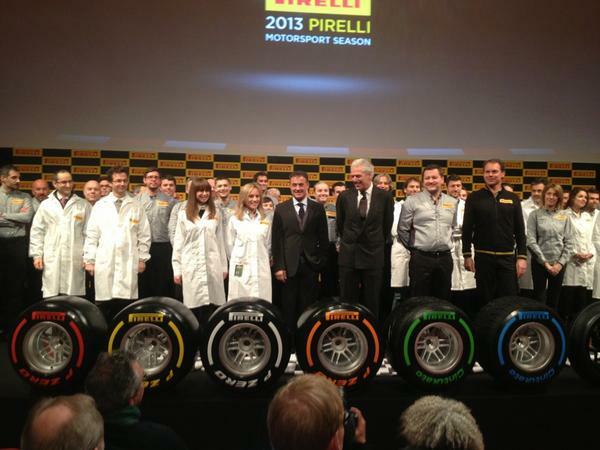 Each tyre will carry its own distinct colouring on the Pirelli and PZero logos affixed to the sidewall. The decision to give each type of tyre its own colour will ensure that fans can easily tell which tyre is being used at any time, rather than tyres simply being marked as ‘prime’ or ‘option’ – given that different tyre combinations will be taken to different events over the course of th eyear. Pirelli plans to offer teams a step of at least one compound between tyres at each race this season, with hard and soft tyres being taken to Australia, Malaysia and China – meaning yellow and silver marked tyres. "We' re very excited by the prospect of returning to Formula One for the first time in 20 years, and we're aiming to be a proactive and colourful partner in Formula One,” Pirelli motorsport director Paul Hembery said. “So what better way to symbolise this than a brightly coloured selection of Pirelli logos to run on the sidewalls? These will enable both live and television audiences to tell at a glance who is on what compounds, which will be vital knowledge as tyres are set to form a key part of race strategy this year." Pirelli's decision to colour code Medium and Hard tyres in similar colours obviously means that they intend to have a gap in tyre compound as Bridgestone did last year. Glad they ditched the green stripe, hopefully it will be easier to spot which tyre each driver is using.. Agreed but, are some colours not a bit close in hue ? Like white and silver ? Why don't they just colour the entire tyre? Murray Walker wrote: Why don't they just colour the entire tyre? Anj x wrote: Agreed but, are some colours not a bit close in hue ? Like white and silver ? Pirelli won't bring Medium (White) and Hard (Silver) compound tyres to a race they will bring either Medium and Supersoft (red) or Hard and Soft (yellow). so should be able to tell the difference. I can imagine Legard and Allen would be able to fill many hours talking about this. I don't know if anyone caught this but Martin Brundle described them as Knife (Silver), Toast (White), Butter (Yellow), Jam (Red). Knife being the hardest of those 4 items, and jam being the softest. Apparently they are going to try and improve the markings.Must say I struggled to spot which tyres were which. There is a bloke there looks a bit like jean Alesi in a suit.Hope he wasn't involved in tyre design he doesn't look the brightest.